And that’s bad news for Republicans. Even with the political winds at their back, Democrats enter the 2018 congressional midterms at a historic geographic disadvantage. 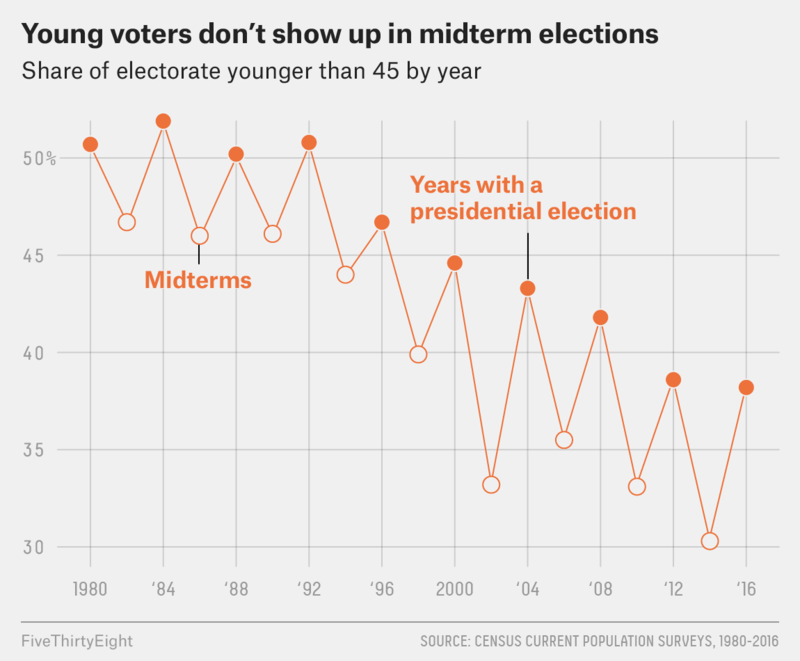 They also face demographic hurdles: Midterm electorates tend to be older and whiter than those that show up in presidential years. That’s part of the reason Republicans picked up so many House and Senate seats in 2010 and 2014. 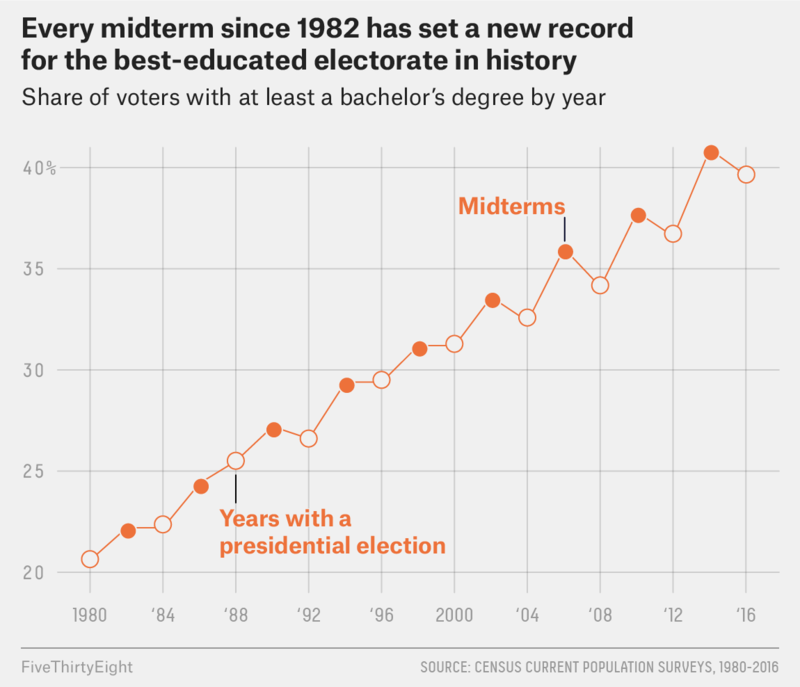 But there is one crucial demographic dynamic working in Democrats’ favor: The 2018 midterms are poised to feature the most college-educated electorate in American history. Almost exactly eight years ago, I argued that Democrats were in deep danger because 2010 could be the “Year of the Angry White Senior.” The premise was simple: Midterm elections had always skewed toward older voters, but never before had there been such a generational divide. In 2008, Barack Obama carried voters 18 to 29 by 34 percentage points but lost seniors by 8 points — a whopping 42-point gulf. Sure enough, Democrats’ young base stayed home in the midterms, and they lost 63 House seats. Eight years later, there’s an analogous dynamic working the opposite way. Midterms have always skewed toward college-educated voters, but never before has there been such an educational divide, particularly among whites. In 2016, exit polls found that Donald Trump carried white voters with a college degree by just 3 percentage points, but won whites without a college degree by 37 points — a massive 34-point gap. By contrast, this gap was just 14 points in 2008. This leaves Republicans dangerously exposed. Just as Obama’s legions of young supporters failed to show up at the polls for Democrats in 2010 and 2014, Trump’s base of whites without college degrees could leave the GOP stranded in 2018. 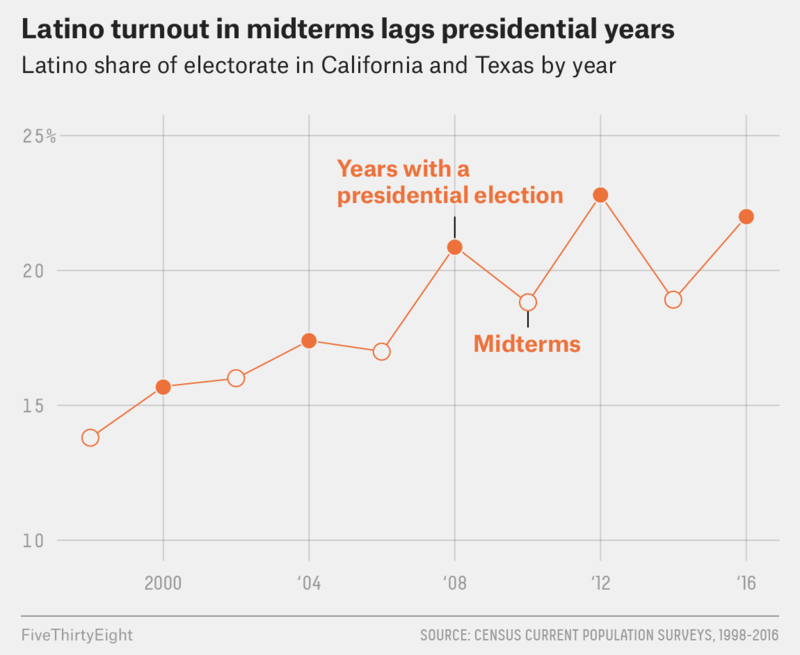 Midterm elections are almost always a referendum on the party in the White House. And although college-educated whites narrowly supported Trump over Hillary Clinton last November, there’s evidence they are now among his most intense detractors. The most recent NBC/Wall Street Journal national survey found that whites with a college degree disapproved of Trump’s job performance 61 percent to 37 percent, with 51 percent strongly disapproving — a remarkable level of intensity for a group that he carried just 10 months ago. By comparison, non-college whites approved of Trump 56 percent to 38 percent, with only 27 percent disapproving strongly. If numbers like these hold through November 2018, college-educated voters could swing hard toward Democrats at a time they represent a disproportionate share of the electorate. Somewhat counterintuitively, the impact of these angry graduates won’t be felt only in highly educated districts. That’s because the story isn’t just about them. It’s just as much about their non-college counterparts dropping out of the electorate. For example: If college graduates were to turn out at 80 percent of their presidential levels but non-college graduates turn out at only 60 percent of theirs — uniformly across all districts — the college-educated share of the electorate would actually go up by about the same amount in a district where 30 percent of voters hold degrees as it would in a district where 60 percent hold degrees. That might help explain why so far in 2017, Democrats have made just as big strides — if not bigger ones — in special elections in blue-collar districts like Kansas’s 4th Congressional District and Montana’s at large seat as they have in highly educated, white-collar suburbs like Georgia’s 6th District. Still, Democrats’ “diploma bonus” is likely to be partially offset by a transition to an older and whiter electorate in the midterms. Of the two effects, the age dynamic has given them more trouble in the past. But Democrats can take solace that the partisan age gap may not be quite as wide as it was last decade: In 2016, exit polls found Trump performed 16 points better with voters 65 and older than he did among voters 18 to 29; back in 2008, Obama performed 21 points better with voters 18 to 29 than he did with voters 65 and over. As for the racial dynamic, the impact of a whiter electorate could vary widely from place to place. That’s because while virtually every competitive district has a big share of whites without college degrees, many districts have only a small percentage of nonwhite residents. There’s evidence, moreover, that African-American turnout is slumping in the post-Obama era. Trump had a 92 percent disapproval rating among black respondents in the most recent NBC/Wall Street Journal poll, but African-Americans make up a large share of the electorate in relatively few competitive House districts. A bigger concern for Democrats plotting to take back the House could be Latino voters. Democrats are targeting seven GOP-held House seats in California and as many as five in Texas — two states with a high share of Latino voters. Together, that’s half of the 24 seats they need to win back the majority. Unfortunately for them, Latino participation in both states tends to plummet in midterm elections. Last month, a political data journalism colleague asked me why the Cook Political Report continues to rate California GOP Rep. David Valadao’s race as “Likely Republican” even though Clinton won his district by 16 percentage points. The answer: His Central Valley seat holds twin distinctions as the least college-educated district in the country and the most Latino seat held by a Republican. In a midterm setting, that’s the worst of all worlds for Democrats — short on a voting group that tends to punch above its weight in midterms, and reliant on a group that tends to punch below its weight. At the end of the day, however, the midterm education gap is more dangerous for Republicans because its impact could be so widespread. In 2016, Trump’s white working class “true believers” showed up, well, for Trump. He won’t be on the ballot in 2018. And the challenge of motivating these voters — who are typically less likely to vote in midterms anyway — could be compounded by Trump’s perpetual bashing of congressional Republicans who are on the ballot. That could allow college graduates to power Democrats to big gains — at least until 2020, when the electorate’s structure shifts again.